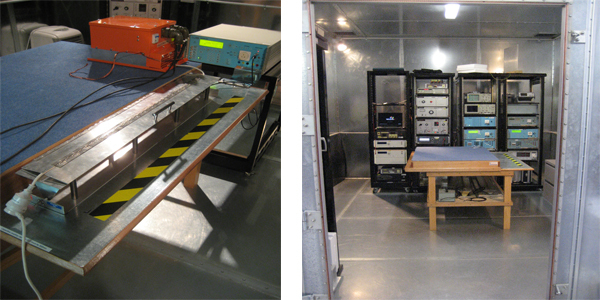 Our EMC compliance testing facilities include a CISPR 25 compliant fully anechoic RF shielded enclosure. This Anechoic RF shielded enclosure can be used for both radiated RF emission & radiated RF immunity measurements. The performance of this Anechoic RF shielded enclosure for radiated measurements in accordance with CISPR 22 has been assessed by comparison against an Open Area Test Site, with excellent correlation observed. The benefits of using an Anechoic RF shielded enclosure over an Open Area Test Site are: Reduced test time, Reduced travel time (no travel to remote sites) and no RF ambient emissions interfering with your results. An RF shielded enclosure has been configured specifically for measurements of immunity to: Conducted RF, Transients, Surges & ESD in accordance with commercial and automotive standards. This enclosure is also linked via a penetration to the fully anechoic enclosure and can also be utilised as a control room for monitoring and exercise equipment. A dedicated enclosure specifically designed for vibration and shock testing with easy access double doors. The EMC testing facilities have been configured to allow for maximum measurement flexibility with all RF shielded enclosures permanently connected via coaxial cable to a control centre, where software control of EMC instrumentation is performed As all EMC measurements are performed inside RF shielded enclosures, RF emissions measurements can be performed without interference from EMC measurements being performed in an adjacent RF shielded enclosure. A broad range of EMC test instrumentation is on hand to cater for the majority of EMC standards. Capabilities include (but are not limited to) measurements of: Radiated RF emissions, Conducted RF emissions, Transient emissions, Transient and Surge immunity, Magnetic field immunity, ESD immunity. Compliance Engineering has facilities to cater for investigation of and modification to client equipment in order to achieve compliance with their applicable EMC standards. These facilities include: A wide range of suppression and electronic components, Soldering stations and hand tools. A workshop area including Pedestal drills, Milling machine and Lathe are also utilised for specialised fixtures.